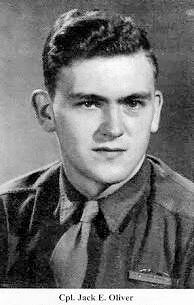 From near Holzheim, Belgium, we loaded onto 2 ½ ton trucks and rode north for about six hours. I found out later from division records that the six-hour trip spanned only 30 miles. We arrived near the town of Zweifall, Germany before daylight in an area of approximately 50 square miles along he east side of the Belgian-German border called the Hurtgen Forest. The towns of Hurtgen and Germeter, Germany lay nearby. At that time our company headcount was about 170 men. We had suffered a low number of casualties the previous two weeks and many who had been wounded had rejoined the unit. We were actually over-strength for a change. After reaching our destination at about 4:00 am, we de-trucked. It was still dark and it was difficult to organize. I recall Sergeant Parker asking, "Where's Olie?" Sergeant Parker was like an old mother hen, checking on her young. We were to take up the positions of the 28th Division's 109th Regiment. The 12th Regiment then came under the command of the 28th Division. We were told to leave our mortars behind and take possession of those of the 109th Regiment. Once in position inside the Forest, we were subject to intense shelling day and night by German artillery. 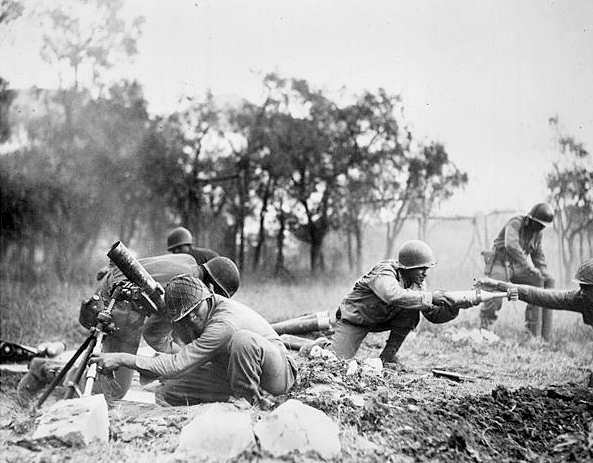 Prior to the arrival of American troops, the Germans had entrenched themselves and had zeroed in their artillery on areas where they anticipated we would be. The deadly effectiveness of their artillery was improved by "tree bursts." When a German shell detonated by hitting the treetops, it would spray shrapnel and pieces of wood over a wider area than if it had hit the ground. Even a foxhole offered little protection. "Hugging a tree" afforded more protection than diving into a foxhole. After a short time in the Forest, casualties robbed us of some of our non-commissioned officers. It was here that Sergeant Parker "tot it." He was a great non-com who was always concerned for the safety of his men. So many of our non-commissioned officers and junior commissioned officers, "tot it" that soon Nestor and I were offered promotions to corporal and squad leader, but we both declined. 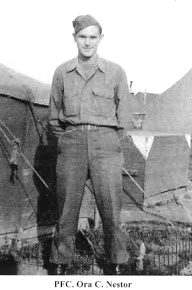 An ammo bearer, John McFall, accepted the promotion. He was killed a couple of days later. The most effective weapon that our division possessed, given the terrain and heavy forestation, was the 81-millimeter mortar, used by the heavy weapons company from Battalion. The 60-millimeter mortars, such as the one Nestor and I operated, were completely ineffective. This is because the 60mm had a limited range and was hampered by the overgrowth of the trees. The 60mm's were phased out in favor of bazookas, which were much more accurate. I did not see any German soldiers while we were in Hurtgen Forest, but their artillery fire was unceasing and had a devastating psychological effect on us. It was disheartening, frustrating and fatiguing to be shelled day and night over the course of many days and nights without the opportunity to fight back or to escape the unending explosions. One time, Nestor, I and the rest of my platoon took refuge in a dugout located near a saw mill. The Germans had dug it and had covered it with heavy timbers during their construction of Hitler's vaunted Siegfried Line, a supposedly impenetrable defensive wall. As I recall, it was about 20 feet by 20 feet and about eight feet deep. During the day, the Forest's trees blocked out most of the light. As a result, there was darkness and little, if any color. Inside the dugout was complete darkness except for an occasional match or a lit can of Sterno that we used for heating our rations. This constant pass added to the sense of hopelessness. There was no sunlight, and most of the time it either rained or snowed. The ground was muddy all of the time and you couldn't get dry or warm. We were always wet, always cold, and thanks to the German artillery, constantly awake or semi-conscious. Nearly all of us suffered from frostbite, hypothermia and trench foot. Sleep deprivation and exhaustion soon led to many "non-battle" casualties. For example, my squad leader, Corporal Elliott accidentally discharge his M-1 rifle when a piece of wire became entangled in his legging and his rifle's trigger. The bullet practically tore off his left arm at just below his elbow. I remember our platoon leader, Lieutenant Graham, telling him that if anyone questioned whether his wound was an accident or self-inflicted, to contact him. Luckily, no one else was injured during that incident. You couldn't see the enemy, you couldn't kill the enemy, you couldn't advance to another location, and you couldn't retreat. You just had to stay put, take a pasting, and watch your buddies be killed or wounded. Many of our casualties in Hurtgen Forest were from "combat exhaustion." This condition is similar in all people, but the outward symptoms can vary from man to man. Some developed very strange behavior. Some would ignore their training or simply forget things and would unnecessarily expose themselves to danger. Others simply reacted slowly to danger, becoming almost like robots. Combat exhaustion has nothing whatsoever to do with fear. It is the mind's eventual reaction to the prolonged and sustained combat stress with no decompression or detoxification. In fact, the most commonly exhibited symptom of combat exhaustion is an irrational lack of fear, and an inability or unwillingness to recognize threats to one's own personal safety. In any case, once a man became afflicted with combat exhaustion, he was of no value as a combat soldier. There was a feeling of despair among the members of my platoon. I really wonder if anyone there thought there was much chance of our getting out of the Forest alive. I, for one, didn't think so. It seemed that everything that had happened and everything that was about to happen was grim.